Located at the crossroads of La Bahia Road and the Navasota River, Navasota was little more than a stagecoach stop until 1859, when the Houston & Texas Central Railroad built its track through the tiny settlement on its route northward. Navasota quickly emerged as a regional shipping and commercial center. Even with the privations of the Civil War, the town grew to 2700 people by 1865. Soon after the war, the town was struck by a series of disasters, including a major fire and outbreaks of cholera and yellow fever, which depleted its population. Not until 1884 did Navasota’s population reach 2500 people. When two other railroads built lines to the town, Navasota became a significant regional shipping center for cotton, livestock, and lumber. Once Navasota was linked by the railroad, it attracted enterprising merchants hoping to capitalize on its new economic position, including a number of Jews. Just a few Jewish immigrants settled in Navasota before the Civil War, including M. Dangigar, a young Polish-born merchant. He had left Navasota by 1870. Other early Jewish settlers included Isidore Bock, who came in 1865, and Arnold Fox and I.Y. Chinski, who moved to Navasota in 1866. Chinski came from Prussia and quickly established himself once he settled in Navasota. By 1870, the dry goods merchant owned $10,000 in personal estate and $4000 in real estate, quite a sum for the time. Chinski later opened a successful banking business in Navasota. These early settlers were soon joined by a growing number of Jews. According to one estimate, over 80 Jews lived in Navasota by 1876. Myer Levy was undoubtedly the most colorful of these early settlers. Born in Posen in 1832, Levy fled his home during the unrest of 1848. He ended up in England, working as a cabin boy on a British merchant ship. When the vessel docked in Norfolk, Virginia, Levy jumped ship and headed South as a peddler. During the Civil War, he owned his own boat and acted as a privateer and Union blockade runner. Levy would secretly take Southern cotton to the West Indies and return with arms and medicine. Both Levy and his wife Jane were ardent supporters of the Confederate cause; Jane was even arrested in New Orleans for being disrespectful to Union officials during the occupation. After the South’s surrender, Levy heeded the call of Mexico’s Emperor Maximillian for former Confederates to seek refuge south of the border and fight against the American-backed liberals. When Maximillian fell from power in 1867, Levy came to Texas. Levy was so taken with the Lone Star State that he soon came up with a plan to sail his boat to Europe and convince people there to immigrate to Texas. After the emancipation of slavery, plantation owners were looking for a new labor force to work their lands and invested in Levy’s scheme. Levy found a group of Polish peasants who agreed to emigrate, but when his boat stopped off in New York for supplies and provisions, his immigrants went ashore and never came back. Undaunted, Levy went back to Europe, gathered another group of Poles, and this time brought them directly into Galveston. Levy’s family had moved to Texas themselves in 1868, settling in Waverly initially. They then followed the route of railroad boomtowns, moving to Bryan, Buffalo, and Jewett. Myer owned stores in each town and speculated in real estate. By 1877, the Levy family had settled in Navasota. Myer opened a general store; soon, he brought over his siblings from Europe, several of whom joined him in Navasota. Simon Levy opened a grocery store in town by 1880 while Sol Levy had a wine and liquor business. Myer’s sister Ernestina married Bernard Goodman, a local Jewish dry goods merchant. If the Levy family was one pillar of the Navasota Jewish community, the Jacobs family was another. Harris Jacobs left Polish Russia in 1865, settling in Baltimore and then Chicago. When he was mugged one day, Jacobs decided to move to Texas, reaching Navasota in 1872 after he found Houston unsatisfactory. He opened a modest store in a wooden shack on Railroad Street, which eventually grew into the largest dry goods store in Navasota. Later, Jacobs opened a wholesale grocery business and eventually became a cotton trader and exporter. Jacobs became one of Navasota’s business leaders, helping to establish the First National Bank of Navasota and serving on its first board of directors. When Jacobs died in 1924, the local newspaper eulogized him as “the last link between the present generation and the pioneer merchants who laid the foundation for the prosperity the city now enjoys,” and claimed that “his business life is a history of Navasota.” All of the businesses in Navasota closed during his funeral, which was led by Rabbi Henry Barnston of Houston. Harris and his wife Hennie’s children married into the local Goodman and Levy families, as the Navasota Jewish community was drawn together by kinship ties. 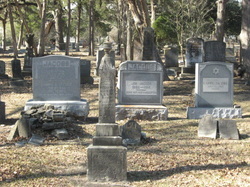 Navasota Jews first began to organize in 1874, when they bought land for a Jewish cemetery. That same year, according to a report in the Jewish South newspaper, the “Hebrew Ladies” of Navasota put on a masquerade ball which raised $140 for the Jewish orphanage in New Orleans. In 1879, Jewish South reporter Charles Wessolowsky visited Navasota and raved about how well the town’s ten or so Jewish families got along with each other and with local Gentiles. He wrote that “all of them are employed in their daily avocation of life, working in their mercantile business.” He found that the nascent community was planning to create a B’nai B’rith lodge and a Sunday school. By 1885, Philip Hamburger had settled in Navasota, bringing a Torah with him. The arrival of the Torah prompted Navasota Jews to begin praying together on the High Holidays. Harris Jacobs, who had studied to be a rabbi in Europe, led these services in rented rooms around town. Jews from other small towns in the area would come to Navasota for the holidays. According to the 1907 American Jewish Year Book, Navasota Jews created a congregation in 1904, with Harris Jacobs as president and S.M. Bock as secretary. The local newspaper noted in 1911 that “all Jewish business houses in Navasota” would be closing for one day for Rosh Hashanah. The group often met at the Odd Fellows Hall, but as their numbers dwindled, they met in private homes. In 1917, Rabbi Samuel Rosinger of Beaumont visited Navasota and helped to form a Sunday school. This unnamed congregation and its Sunday school were short-lived; they never acquired a permanent house of worship or hired a full-time rabbi. By the 1920s, the informal congregation had disbanded and Navasota Jews traveled to Houston for services. Today, the Torah is being used by Congregation Shaar Hashalom in Clear Lake, Texas. While Navasota never fulfilled its early promise as a boomtown, Jewish immigrants continued to find opportunity there in the early 20th century. Jacob and Fanny Werner moved to Navasota from St. Louis in the 1890s, opening a merchant tailor shop which remained in business for several decades. By 1900, Simon “Coonskin” Cohen was a fur merchant in Navasota, while his wife Mary Levy Cohen ran a boardinghouse for several years until the Cohen family moved away in the 1910s. In 1912, Russian immigrants Ben and Sophie Isenberg settled in Navasota, opening a produce business. Four years later, their daughter Fannie and her husband Ben Silverstein moved to Navasota and joined the family fruit business, which was now called Isenberg & Silverstein’s Produce. They would buy fruit in Houston and sell it in their Navasota store. Both families lived together above the store. Silverstein was an Orthodox Jew, closing his store for two days on Rosh Hashanah. He was an active member of the Orthodox congregation Adath Emeth in Houston. In 1936, Silverstein bought out the business, which became Silverstein’s Produce and Grocery Store. Ben and Fannie’s daughter Sarah Ann married Morris Hoffman, who moved to Navasota after World War II and joined in the business. In 1962, Morris bought the operation, and a few years later built a new Lucky 7 grocery store. Morris and Sarah Ann were among the last Jews to live in Navasota. A World War II veteran who helped liberate the Dachau death camp, Morris would speak to school groups about his experience and the Holocaust. The Jewish population of Navasota in the 20th century was never large. Jewish merchants did not dominate the streets of downtown as they did in other Texas towns. By 1937, only 33 Jews lived in Navasota. Many of the children raised in Navasota, and even their parents, moved away to larger cities, especially Houston. Any semblance of a Jewish congregation was long gone by the mid-20th century. Today, the last remaining vestige of Navasota’s Jewish community is the cemetery – a large gated section in the city’s burial ground. The 90 gravestones only fill a small portion of the land. When it was purchased in the 1870s, the recently arrived Jews expected Navasota’s Jewish community to grow along with the city, although ultimately, neither did.